Senior Warlayirti artists Brandy and Helicopter Tjungurrayi and Larry Gundora consider cultural issues with advisor Putuparri Tom Lawford (far left), curator John Carty (left) and translator George Lee (far right) in Balgo, November 2009. Photo by Tim Acker. FORM Canning Stock Route Project. It was an historic moment for the artists and organisations involved in the project. The Canning Stock Route collection tells the stories of the Country intersected by the stock route, stories of the Dreaming, first contact, conflict, collaboration, movement and unbreakable family ties that connect Aboriginal people across the desert. As such, the collection’s acquisition signaled to Aboriginal contributors that their stories were considered an important part of Australia’s national heritage. In 2009 FORM and the National Museum entered into a partnership to co-produce the exhibition Yiwarra Kuju: The Canning Stock Route. Over 250 interviews and oral histories had been recorded over the life of the project, as well as hundreds of hours of film footage, and elements of this material were incorporated into the exhibition. Yiwarra Kuju was launched in Canberra in July 2010 and attracted more visitors to the National Museum than any other exhibition in its history. Its popularity with audiences undoubtedly reflected the project’s careful handling and appreciation of Indigenous Cultural and Intellectual Property (‘ICIP’), which gave the exhibition an undeniable authenticity. ICIP represents the self-determined right of Indigenous people to protect and control the external use of their ideas, art and culture. Unlike ordinary Intellectual Property (‘IP’), ICIP also refers to collective rather than individual rights over cultural knowledge and materials. This case study will outline how ICIP was managed and protected throughout FORM’s Canning Stock Route Project with an emphasis on the importance of cultural leadership, collaboration and the recognition of legal and Indigenous rights. Yiwarra Kuju: The Canning Stock Routetells the story of the longest historic stock route in the world. Running 2,000 kilometers across the Western Australian desert, the route was born out of the economic ambitions of pastoralists at the turn of the 20th century. During the fifty years of its establishment and use, Aboriginal people were pushed and pulled away from their traditional lands to new locations. Fear of kartiya or non-Aboriginal people kept many families away from the precious water resources on the route, while other families followed the drovers, and their strange new food, to foreign locations in the north and south, where they stayed or moved on again to other settlements. Others still followed the stock route during times of drought to places where relatives had settled earlier. This 20th Century diaspora transformed the social and cultural landscape of the desert forever, interrupting connections to Country maintained by more than ten language groups over countless generations. But the Canning Stock Route, and the movements it propelled, did not extinguish these connections to Country nor its remarkable history. Senior translator Ngalangka Nola Taylor and filmmaker Curtis Taylor show elders, Nancy and Wokka Taylor, the layout of the Yiwarra Kuju exhibition in Parngurr, October 2009. Photo by Tim Acker. FORM Canning Stock Route Project. The artists involved in the Canning Stock Route Project were keen to record their stories for future generations, to enhance mainstream understanding of their culture and history and to communicate their art to new audiences. Collaboration was key to achieving these goals. Aboriginal art centres, artists, cultural advisors, translators and creative apprentices worked closely with the FORM project team over five years to research, record, produce and curate content and then clear it for public use, supported by committed industry partners. Numerous bush trips and workshops were organized over the life of the project, the largest of which was the six-week, 1,850 kilometre journey along the stock route from Wiluna to Billiluna, which took place in July and August 2007. It brought together around 60 artists from seven art centres and members of the intercultural team who would continue to work and be mentored on the project for its duration. Other workshops were conducted in communities, on the stock route, in Broome, Perth and Canberra. Other workshops were requested by artists and elders to revive culture, develop skills and pass down knowledge to new generations and were combined with the first phase of a comprehensive permissions process to address the uses of ICIP. A huge amount of extremely valuable material was recorded in these workshops, however, not all of it was suitable for public use. The Canning Stock Route Project worked closely with and employed Aboriginal translators and cultural advisors throughout the project to ensure that ICIP was handled appropriately and that cultural sensitivities and the needs of communities were carefully addressed. Oral histories were first translated into English from traditional languages and transcribed on paper by Aboriginal translators. The various story elements of each interview were identified and numbered on comprehensive permission forms, which allowed contributors to assess the suitability of each element for a range of purposes including exhibition, books, multimedia, online access, storage in public collections and community archives. When curators returned to communities with these detailed permission forms they were accompanied by one of the senior project translators and cultural advisors, Ngalangka Nola Taylor and Putuparri Tom Lawford, who would interpret and provide advice to elders, and direct non-Indigenous team members in relation to sensitive cultural issues. Cultural advisors, translators and family members provided invaluable guidance to the project in helping to determine which stories were ‘open’ and which stories should be protected for the benefit of communities. Some stories, which were generously shared in the privacy of contributors’ homes, were not intended to be communicated widely beyond that environment. Though not strictly secret-sacred, they were considered culturally sensitive for a number of reasons, and due to a long history of Aboriginal sacred knowledge having been made public and exploited by non-Indigenous researchers, communities are understandably wary of being exploited. As the project team began to collate material for the Yiwarra Kuju exhibition, the content was shaped by the artworks in the collection and by the connections of the various groups to the Country crossed by the stock route and to each other. The curatorial team defined the content and layout of the exhibition, Freeman Ryan Design created visual plans that showed the placement of artworks, themed areas and regions of ‘Country’, and filmmaker Nicole Ma created videos from hundreds of hours of footage, which enhanced and added insight to the artworks and thematic regions of the exhibition. Once the draft material was complete, the project team returned to communities wielding vinyl exhibition plans, manuscripts of exhibition text, rough-cuts of the exhibition films and printouts of the curated sequences of artworks to present to art centres, artists and their communities. 2) Individual clearances to use elements of recorded material, itemized in detail, for a variety of named purposes. Conducted with translators and family members. 3) Collective approvals of ICIP in draft exhibition, book and multimedia material. Draft content presented to artists and contributors in large group meetings at each art centre. Translators/cultural advisors, art centre managers and project team present. Men’s and women’s issues discussed separately in smaller meetings. All necessary changes noted, amended and returned to art centres for final approval. ICIP issues also permeate beyond the preparation of exhibitions. 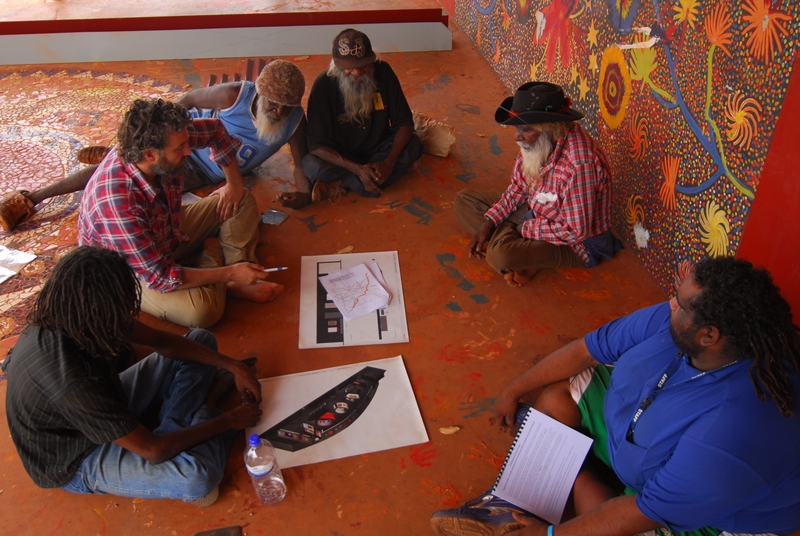 Discussions between Solid Arts and key stakeholders in the Canning Stock Route Project revealed concerns as to consumers’ level of education regarding their purchasing decisions. Tim Acker, co-founder of the project, hopes consumers will make ethical choices when purchasing Indigenous art. Ethical choice includes ensuring artists and local communities’ consent is obtained prior to sale of artworks and ensuring that artists are adequately identified in their artworks. The Indigenous Consumer Code, introduced in a number of States, is a step forward in Tim’s mind. 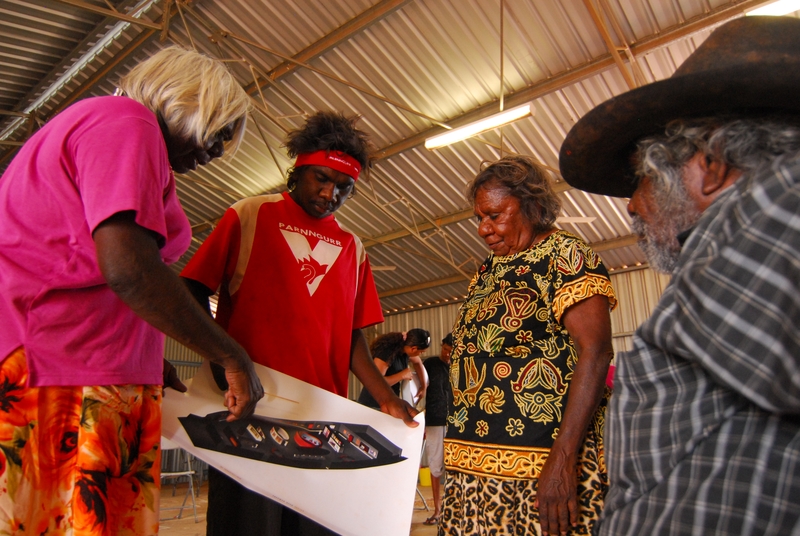 Curator Hayley Atkins explains the exhibition layout and designs to fellow Martumili Artists in Parngurr, October 2009. Photo Tim Acker. FORM Canning Stock Route Project. Carly Davenport, project co-founder and manager, hopes that all Australian galleries and museums will have stronger processes and legalities in place to deal with collaborative partnerships between institutions and remote area enterprises in the future. 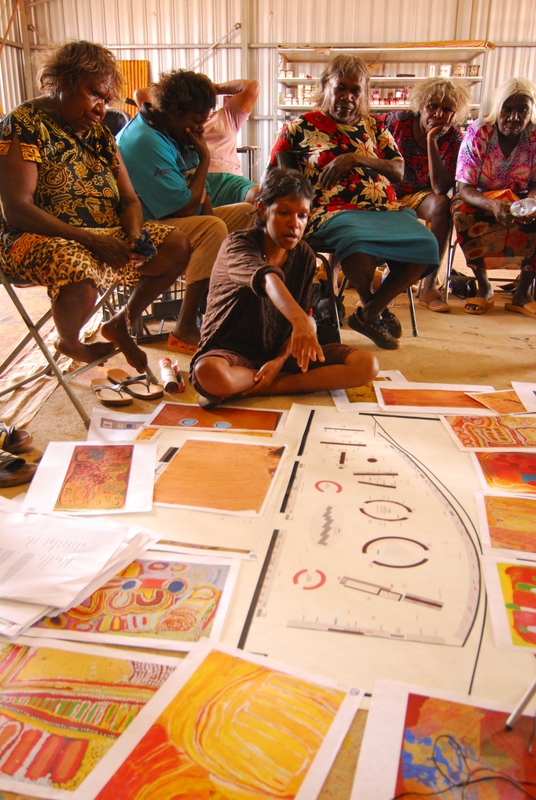 Project co-curator and developer of its ICIP processes, Monique La Fontaine, suggests that ICIP is best factored into project planning by means of allowing time and funding to employ Aboriginal translators and advisors and make repeat visits to ensure that ICIP is used in keeping with the intentions of contributors. As the exhibition tours to venues around the Country (Perth Exhibition and Convention Centre in November 2011 and the Australian Museum in Sydney, December-January 2011-12) the Canning Stock Route Project prepares to embark on the next major chapter of its ICIP commitment. In 2012, it will repatriate hard drives of the project’s content to all ten of the Aboriginal stakeholders involved in the Canning Stock Route Project. This digital content, approximately two terrabytes in size, includes over 250 oral histories and interviews, hundreds of hours of film footage, over 150 short films, nearly 20,000 images and a wealth of other material. Meetings with art centres and artists to develop a management plan for the future use of ICIP in this collective archive will begin in late 2011. The Yiwarra Kuju: The Canning Stock Route exhibition is a timely reminder that Indigenous social and artistic dispersal are interrelated. The exhibition is a rich collection of stories of cultural heritage, social change and diversity. The FORM Canning Stock Route Project gives a powerful voice to Aboriginal communities and its success is no doubt in part due to tireless collaboration between key stakeholders in regards to Aboriginal artists’ ICIP rights.